We have all seen them. On any clear day the sky far above our heads is usually always cluttered with long thin streaks that look like clouds except they appear in patterns. They hang in straight lines and frequently criss-cross. Over time they spread out, creating artificial cloud cover. It is obvious that what we are seeing is some different kind of vapor emitted from jet aircraft. But people who know and understand the normal water vapor trail of a high-flying jet aircraft evaporates quickily and does not hang in the sky long enough to create "tracks" like we are seeing. 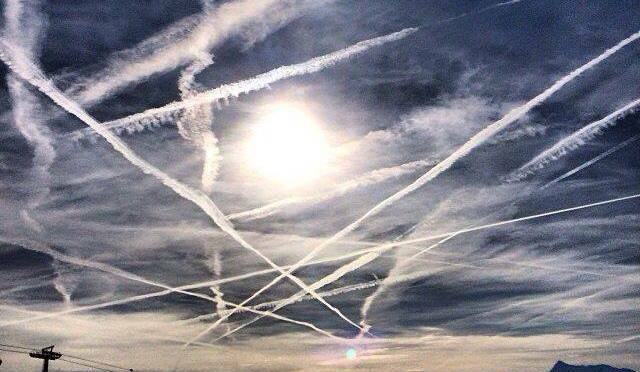 And while we know there are thousands of aircraft flying over the country on any given day, it is hard to believe they are so numerous to be criss-crossing or flying in formations to create the vapor patterns we are observing. This phenomenon has been the subject of concern among conspiracy theorists for years. And it has been occurring for years, without any explanation from military or government sources. These artificial clouds in the sky, commonly dubbed "chemtrails" because conspiracy theorists believe they contain some kind of chemical that slowly drops down over the landscape, are being observed all over the world. The mystery lies in what they contain, who is doing this and how this stuff is affecting our general health and well-being. A documentary film "What In The World Are They Spraying" by G. Edward Griffin, Michael Murphy and Paul Wittenberger suggests that the trails are part of a geoengineering program designed to repel the threat of global warming. Research by the team found that scientists at Carnegie Institution were involved in research on ways to inject the atmosphere with materials designed to artificially ward off the heat of the sun, thus cooling the planet. The idea was to spray aerosols of sulfate into the stratosphere to produce a global sunshade. A main author of the study was Ken Caldeira, who in a September 2008 story in the Guardian cited the idea of deploying jumbo jets in the upper atmosphere to "deposit clouds of tiny particles there, such as sulfur dioxide. Dispersing around one metric ton of sulphur dioxide per year across 10 metric square kilometers of the atmosphere would be enough to reflect away sufficient amounts of sunlight," the story said. A recent report in Natural News said environmental activists and serious amateur scientists have been collecting water and air samples after heavy chemtrailing. Analysis of both the air and rain water found at ground levels shows traces of aluminum, barium and strontium are present. The problem with this is that we are all breathing these toxins into our lungs, and they are infesting plant and animal life everywhere. An Arizona research study found extremely high levels of barium or aluminum or both in the blood of seriously ill residents. Barium is a heavy metal that is as toxic to human health as lead, arsenic and mercury. It is found to increase blood pressure, cause breathing problems, interrupt regular heart rhythm, cause muscle weakness, affect the nervous system and damage the brain, liver, kidney and heart. That the world is now experiencing extreme changes in weather patterns, with intense flooding rains or drought occurring in places that normally experience more moderate weather, suggests that something radical is occurring. Is the weather change the result of global warming, increased carbon emissions, or the secret chemtrails in world skies? Have those secret experiments with the world's atmosphere brought about climate change? Have our governments made a serious blunder in their attempt to control the onset of global warming without forcing industry to control carbon emissions from smokestacks? In posting chemtrails filled with barium, Mr. Sprat has listed a most serious concern for all of us.